If we look back to the “1 pretty sure and 3 maybes” I wrote about before the regatta began Canada is performing to form with the exception of the men’s quad. What a heartbreaker, and to be specific – I’m talking about Rob Gibson’s heart. Unfortunately I think it might be shattered right now – and I can’t blame him (it?). I’ve often said that the quad event is the most technical. 4 guys, 8 hands and 8 blades moving at the speed of an eight. If you’re on it – it’s magic; if it gets ahead of you – you’re in for trouble. The conditions on Saturday morning were horrendous. Sadly – all lanes were equally horrendous so the FISA Fairness Committee was slow to act; it wasn’t rowing – but it was fair. The Canadian quad was behind, but was absolutely moving into a position that would have given them a pass into the finals and a shot at the medals. 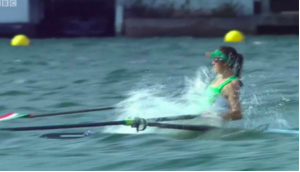 In a flash moment that every rower has nightmares about – Rob Gibson lost his grip on one of his oars. It’s understandable – he was sweaty= slippery, he was soaked by the waves = slippery, and he was in the last few 100m of the race = tired hands = slippery. He lost it, it spun around, he couldn’t get it back and they dropped to last position. That was tough to watch. The heartbreak came in their repechage. Anyone would have told you at the start that it was still going to be a hard fought race. The event has very few entries and that results in a very tight field (no weak ‘filler’ nations). I’m not there – but what I saw on TV was that when Canada was not in a leading position going into the ½ way mark (1000m) Rob tried harder. It was subtle but there was a difference between his bodywork and bow’s bodywork. While Kia Nurse can dig down and do more as an individual for her women’s basketball team, that sort individual rise up doesn’t work in rowing unless your crew goes with you. The result of an individual rower trying to do more for their crew has the result of pressing your foot onto the brake. I saw intensity go up – and speed go down. I’m so sorry about it. I’m kind of tearing up just writing this. Now – Jennerich and Obee – I pitched them as killer sprinters in the last 500m. It was a nice surprise to see them attack the first 1500m with a pace that put them in a position to own the top progression spot without even needing to press their “go nuclear” button. With gas in the tank, and an ace up their sleeve (that everyone knows about) they move to their semi-final tomorrow morning. With any luck the crap weather that is once again predicted will hold off. It’s almost impossible to hit your top gears in really choppy water. The women’s eight surprised me – or maybe they just surprised my biased hopes for them. How can I not think that the Canadian women’s eight always has a medal in them? I have to believe! They struggled more than I expected in their heat; it didn’t look as if they had any ability to really gear up and challenge. Did they need to? Maybe not – As soon as they knew they weren’t winning the heat they could chill until the rep – but I know Lesley and she wouldn’t give away a win if she thought they could take it. They will advance to the Olympic final because the late entry Australia (a result of the Russian doping scandal) just isn’t there, but when they get to the final – they are going to have to find a turbo booster to get on the podium. The men’s four races their semi-final tomorrow. Sometimes I think the drama in a semi is higher than in the final: Desperation lifts some crews and destroys others. The cut line between 3rd and 4th changes everything; you get to the final or you don’t even have a shot. Coupled with the epic physical battle that accompanies every race at this level, the Canadian four will have to keep their heads and efforts together. If they want to advance to the final they’re going to have to go through the emotional battle of a semi first. Now on to the crews who I didn’t tap with even a maybe – my apologies for omitting the women’s pair. They are young, but that doesn’t mean they didn’t come into racing in Rio without ambition. This combination had its first ever international race in their heat, so in dealing with everything the Olympics can throw at them – they did a great job. I look forward to watching their young rowing careers progress. Women’s single – I think Carling Zeeman can make the final. She is young and strong and some of her races show really great promise. But the young part is working against her here… she isn’t yet channeling enough (quiet) confidence and, dare I say – swagger to own the top spots consistently. A rower liked Zeeman, ranked 4-8, can be at the mercy of the draw. Coming in 3rd in the repechage is going to cost her. If she’d won or had been 2nd in her rep the next draw could have worked more in her favour. Now she needs to hope for a lucky draw and a doable semi final. She’s going to need the race of her life to make the final – and then to get on the podium – she’ll need another. Go Carling Go! The men’s lightweight four – These guys have a lot of heart but they are racing in an event that is usually so tight between 1st and 9th that advancing into the semi’s requires talent, speed, fitness and, again, if you’re not in the top 4… luck of the draw. Everyone outside of the top 4 might find themselves in a progressing round needing the race of their life just to proceed. I hope they are extraordinarily proud of being Olympians, and… they have fire to follow their next ambition – Tokyo or other.